Students actively engaged with Jeri Katherine Howell during the Keynote address at the 2018 Green and Healthy Schools and Kentucky Project Need Youth Summit and Awards Luncheon. 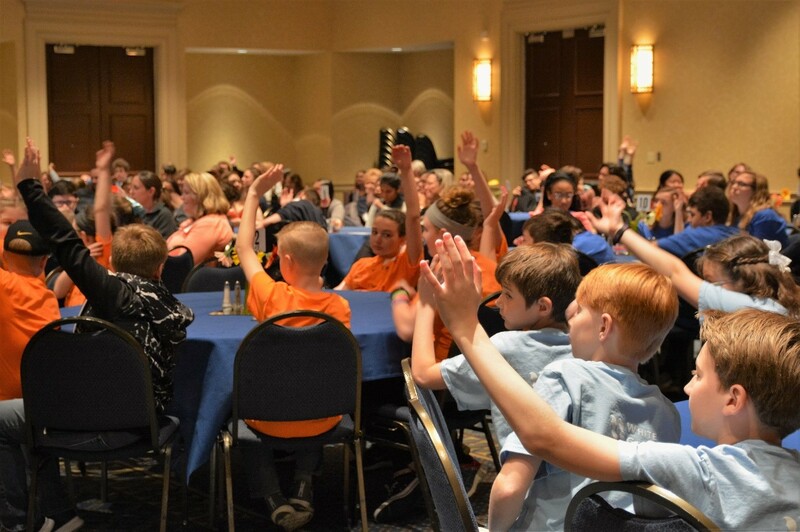 Kentucky National Energy Education Development (NEED) and Kentucky Green and Healthy Schools (KGHS) brought together over 200 students and educators to learn from, connect with and inspire each other during an annual youth summit on April 26, 2018 at the Lexington Convention Center. The event showcased the best work by students to explore energy and the environment through science, technology, engineering and math projects. Students from 30 schools participated with projects in recycling, waste and water conservation, energy efficiency native plant habitats, and development of renewable energy recharging stations. Mercer County Senior High School student explain their Kentucky Green and Healthy Schools water quality project to students from White’s Tower Elementary School. Photo by Elizabeth McNulty. The event is supported in part through a state energy program grant that also supports the NEED project that provides energy education curriculum to K-12 teachers and students. Chad Von Gruenigren from the Kentucky Division of Water talks macroinvertebrates with students from Tichenor Middle School. Photo by Elizabeth McNulty. Keynote speaker Jeri Katherine Howell praises the students on the positive impact of their projects on their schools and the communities where they are located. Photo by Elizabeth McNulty. Howell pointed out how the NEED and KGHS projects relate to environments at their schools as well as communities beyond Kentucky. Robyn Whitted discusses the KY EXCEL program with students from the Shepherdsville Elementary School. Photo by Elizabeth McNulty. The Kentucky NEED project presented top honors to six student-energy teams representing both public and private schools, with three schools selected to receive national-level awards for their exemplary leadership, energy knowledge and community involvement. Representing Kentucky at the national awards event in Washington, D.C. are: St. Agnes School, Louisville, recognized for its energy research, education and outreach projects within the school and community. Lexington’s School for the Creative and Performing Arts “Hydro Hero” energy team earned the national, junior rookie project of the year. The team’s project developed recycling programs within the school and greater Lexington community and reduced waste associated with disposable plastic water bottles. Lloyd Memorial High School’s energy team is the national runner-up for a senior level project of the year. Its students educated the community about energy conservation by hosting outreach events, including a district-wide initiative to collect plastic to build ‘buddy benches’ for each school in the district. KGHS, a project-based program that uses the entire school building and grounds as a learning laboratory for students recognized 13 schools for their outstanding environmental education projects. KGHS is a program of the Kentucky Environmental Education Council and the Kentucky Department of Education. Students and faculty from duPont Manual High School who completed all 9 Kentucky Green and Healthy Schools categories to qualify as a model Green and Healthy School for the 2017-2018. Photo by Elizabeth McNulty. Students from Redwood Cooperative School who completed both a Kentucky NEED project as well as a Kentucky Green and Healthy Schools project in a single school year. Photo by Elizabeth McNulty. Other NEED student energy teams that participated in the Youth Summit at the elementary level were Old Mill Elementary, Bullitt County; Sacred Heart Model School, Lexington; Shepherdsville Elementary, Bullitt County; Southern Elementary, Fayette County; St. Martha School, Louisville and White’s Tower Elementary, Kenton County. At the junior and senior levels the schools that participated were North Middle School, Hardin County; Plano Elementary, Warren County; Tichenor Middle School, Erlanger-Elsmere Independent and Morgan County High School, Morgan County. Model Kentucky Green and Healthy School award presented to DuPont Manual High School, Jefferson County Public Schools. Kentucky Green and Healthy School recognition went to: the Academy for Leadership at Millcreek, Fayette County; Eminence High School, Eminence, Independent; Family Care Center, Fayette County; John Hardin High School, Hardin County; Kentucky County Day School, Louisville; Lloyd Memorial High School, Erlanger-Elsmere Ind. ; McLean County Middle School, McLean County; Mercer County Senior High School, Mercer County; Ockerman Middle School, Boone County; Redwood Cooperative School, Lexington; Washington County High School, Washington County; and White’s Tower Elementary School, Kenton County. Students from Anne Mason Elementary School Explain their Kentucky NEED Energy project to a teacher from White’s Tower Elementary School. Photo by Elizabeth McNulty. For additional information about the Kentucky NEED Project, contact Karen Reagor, kreagor@need.org. For information about the KGHS program, please contact Billy Bennett at billy.bennett@ky.gov.